Alfred James Walden was born on 1 January 1867 at 8 South Street, Lambeth, London. 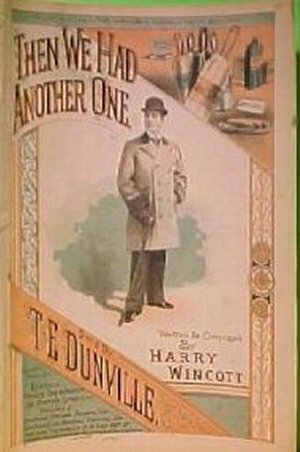 He was later known professionally as Harry Wincott. He was the son of coach body maker Alfred Walden and Charlotte Susan née Phillips. 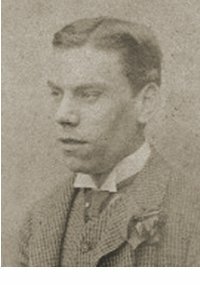 Alfred and Charlotte were to have five children; Harry, Emily Eliza (b1868), William deGraft (1871-1891), Francis Charles (1874-1931) and Frederick Philip (1878-1935) - all born in Camberwell. At the time of the 1871 census the family were living at 33 Neale Street, Camberwell but by 1881 the family had moved to 79 St George's Road, Camberwell. At this time 14-year old Alfred was listed as a coach body maker, like his father, although this did not last long since he was soon working as a ledger clerk. He had ambitions to be a songwriter and he was dismissed from his clerk's job for writing songs in the ledgers. When he was sixteen he got an interview with a great music hall artiste of the time 'The Great Vance', who bought one of his songs for seven shillings and sixpence (about £35 at today's value). He invested some of this money in the paper he would need to start writing in earnest. He struggled for a long time until one of his songs, written under his professional name of Harry Wincott, was bought for £4 (over £400 at today's value). It was sung by the famous music hall performer Vesta Tilley in her act and Harry's songwriting career began in earnest. On 23 March 1889, at Leeds, Harry married Eliza Mary Ann Dyer (1866-1926), the daughter of bookbinder George Turffrey Dyer (1838-1908) and Hannah Mary née Phillips (1836-1906). Harry gave his profession as 'Songwriter' and Eliza as 'Tailoress' and they were both recorded as living at 3 Upper Elmwood Street, Leeds, which was the home of Eliza's parents and family at the time. By 1891 Harry and Eliza (photographed at left) were living at 80 Crampton Street, Newington, London, with their baby son Lawrence. Harry and Eliza were to have eight children: Lawrence Harry Wincott (1889-1943), Sidney Charles Wincott (1892-1940), Frederick John Wincott (1894-1918), Victoria Helena Wincott (b1897), Ernest Wincott (1898-1898), Alfred Francis Wincott (b1900), Edward William Wincott (b1902) and Irene (1905-1925). In 1901 the family were living at 149 County Terrace, off 149 New Kent Road, Newington. For some unknown reason Harry was recorded under his professional name of Harry Wincott rather than his real name of Alfred James Walden and his wife and children were also listed as Wincott. His gave his profession as 'Songwriter'. Harry's most prolific songwriting period was between 1890 and 1920, writing some 2,000 songs in his career. Nevertheless Harry never made much money from his songwriting since at this time songs were sold for small amounts to the performers themselves, who would then usually publish the song under their own names. Even those songs that were published in his own name didn't earn him a great deal and it was something of a hand-to-mouth existence for him and his family. In 1925 his youngest child Irene, who had married in 1924 and had a baby daughter, died in tragic circumstances when her dress caught fire and she was killed. 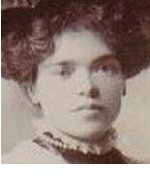 Eliza, Harry's wife, was a sickly woman and apparently the grief she suffered when Irene died hastened her death in 1926 from a cyst on the lung. 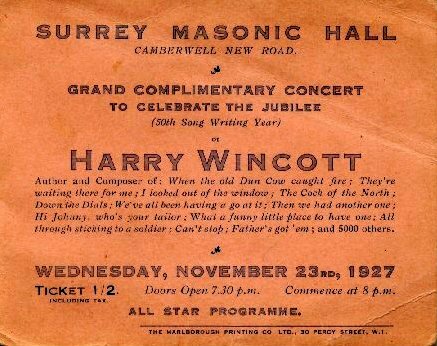 After the death of his wife Harry struggled professionally and on 23 November 1927 a benefit concert for him was arranged by his friends in the profession and held at the Surrey Masonic Hall in Camberwell. Celebrating his 50th year of songwriting, tickets were sold for one shilling and two-pence and ticket holders were promised an All Star Programme. 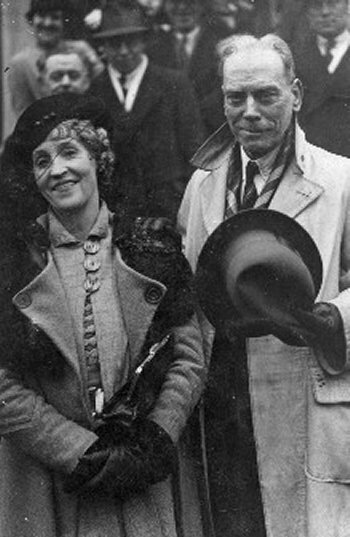 On 6 March 1937 at Lambeth Registry Office, 70-year old Harry married 64-year old widow Margaret Pink. Harry stated his profession as 'Author and Songwriter'. Margaret gave her profession as 'Music Hall Artiste'. Her stage name was Daisy Pink and she managed a troop of dancers. Shortly after their wedding Harry and Margaret moved to Yeovil. In 1941 Harry and Margaret were the guest artistes at a local talent show at the Odeon Cinema. Harry sang one of his own songs and his wife also performed as well as designing and arranging the final tableau. Harry also took part in a victory parade in Yeovil at the end of the Second World War. Sadly, Harry lost touch with some of his children who were not happy with their father's re-marriage. Harry Wincott died in Yeovil on 20 April 1947. He had been admitted to the Public Assistance Institution in Yeovil a couple of weeks before his death as there was not a spare bed at the hospital and he died of gangrene of the legs aged 80. He was, apparently, in good spirits to the end and one of his last requests to his wife, Margaret, was for a pint of beer. Harry was buried in Yeovil Cemetery. 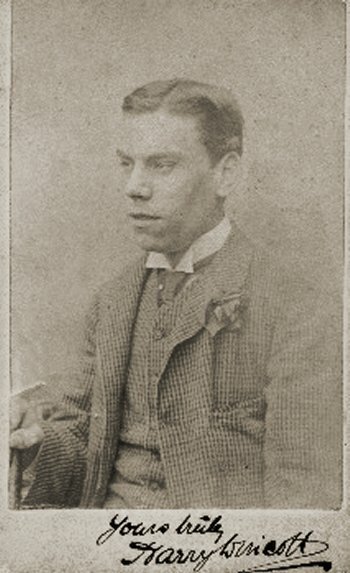 A carte de visite of Harry Wincott, probably dating to the 1880s. 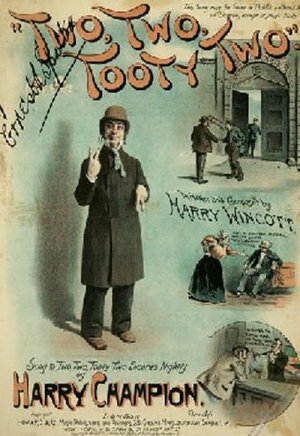 One of Harry Wincott's songs, performed by well-known music hall singer and Cockney comedian Harry Champion (real name William Henry Crump). Another of Harry Wincott's songs, this time performed one of the leading eccentric comedians on the music-hall stage, TE Dunville (real name Thomas Edward Wallen). An advertisement for the benefit concert for Harry Wincott in 1927. A photograph of Harry Wincott and his new bride Margaret 'Daisy Pink' at their wedding at Lambeth Registry Office on 6 March 1937. Shortly afterwards they moved to Yeovil.